With the first-quarter earnings reporting season nearly finished, European companies’ earnings were the best of the pack, analysis by strategists at Societe Generale shows. Of US and European companies, 92% have reported first-quarter results, while 94% of Asian companies reported. Europe’s reporting season was the best, with 68% of European companies’ earnings per share above or in line with consensus, more than the 10-year historical average of 63%. Almost 45% of European companies beat consensus, while a relatively low number of companies in Europe undershot consensus expectations. This was proportionately the lowest level of disappointments since the first quarter of 2011, which was also 29%. Looking at the companies in the Stoxx 600 index, oil and gas surprised positively, while oil services companies – which are historically more tightly correlated to oil prices – were hit by low oil prices in the first quarter. Beverages, food, media, insurance, banks, biotechnology and pharmaceuticals, hotels and leisure, aerospace and defence, telecommunications services, construction materials, automobiles, paper and utilities saw more beats than misses for their earnings per share in the quarter. By contrast, real estate was among the sectors that disappointed. Construction, metals and mining, durables, apparels and luxury and chemicals all posted earnings per share below consensus for the second straight quarter. However, the really good surprise from European companies’ earnings was the stronger level of sales, the report shows. For the first time in three years, the level of positive sales surprises reached 33%. It was the third successive quarter to see a rise in the level of upside surprises, while the number of disappointments, at 8% so far, was way below the historical average of 17%. The first quarter was good for sales especially in the eurozone, boosted by the recovery and a weaker euro. The single currency area could register the lowest number of negative surprises for sales of the past 10 years. By contrast, US companies’ sales were harmed by the stronger dollar, the Societe Generale analysts said. Although US results have been in line with historical averages for positive and inline EPS, this is not the case for sales. So far, 19% of US companies have published sales below consensus expectations – much more than in recent quarters, and above the 10-year historical average of 13%. Asian companies saw rather poor earnings, as they were hit by the US economic downturn in the first quarter. Companies in China, Indonesia and Singapore, where economic growth is slowing, disappointed the most. But the clouds might be lifting, as earnings growth expectations for this year are picking up almost everywhere, the report’s authors note. EPS growth expectations for the Euro Stoxx index of blue chip eurozone stocks stand at 18% while for the pan-European Stoxx 600 they are lower, at 5.5%. 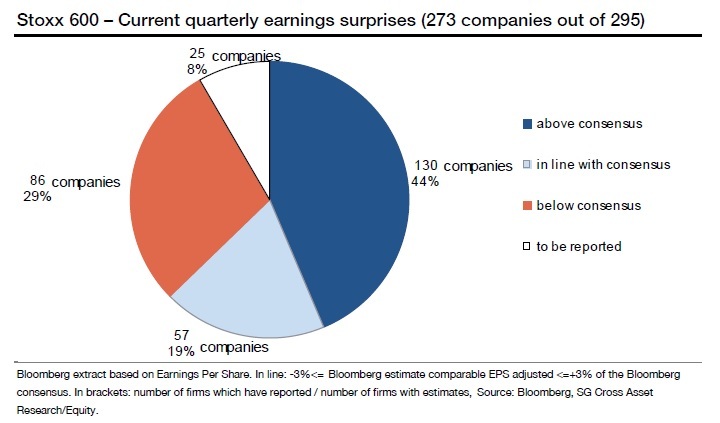 For the S&P 500, EPS growth expectations are 1.5%. In Asia, EPS are expected to grow strongly overall, with South Korea seen at 32.8%. Australia is the only major market where negative growth, of minus 2.3%, is expected. This entry was posted in News and tagged Asian companies, earnings, EPS, European companies, eurozone, investing in equities, investing in stocks, US companies, US dollar strength on May 28, 2015 by Antonia Oprita.